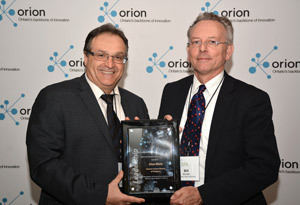 Each year, ORION recognizes the best and brilliant movers and shakers with the ORION Leadership Awards in three categories: Kindergarten to Grade 12, Higher Education, and Innovation. This year, we received several illustrious candidates across the research, education and innovation sector and the selection process was very difficult to narrow down. The Leadership Award winners demonstrate outstanding leadership, spearheading initiatives that truly opens the way into tomorrow’s digital information economy, and improving lives through connectivity. 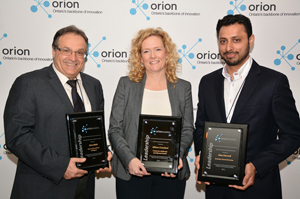 Announced at the awards ceremony at the THINK Conference, ORION is pleased to announce the winners of the 2015 ORION Leadership Award. Kathryn Anthonisen presents Dr. Allison Crawford with the Innovation award. Dr. Allison Crawford is the program director for the Northern Psychiatric Outreach Program at the Centre for Addiction and Mental Health. She is also an assistant professor of psychiatry at the University of Toronto and staff psychiatrist at Mount Sinai Hospital. Since taking over leadership of the Northern Psychiatric Outreach Program at CAMH in 2012, Dr. Crawford has introduced several initiatives to improve the healthcare of undeserved populations in remote, rural communities across Northeast and Northwest Ontario and Nunavut. Their projects use televideo and online resources to increase their capacity to provide access to care, thereby creating more collaborative partnership model with target communities, and continuing professional development to colleagues working in remote areas. They also work with the Ontario Telemedicine Network to match family doctors in remote communities with CAMH consultants. The application of technology to the healthcare challenges in these areas has allowed the program to close sizable gaps in patient care. Dr. Crawford’s strategic, innovative thinking, commitment to health equity, perseverance and collaborative engagement with communities have laid the groundwork for enhancing the health of at-risk Ontarians and improving the resilience and independence of the communities they work with. Bill Mantel presents Dino Miele with the Kindergarten to Grade 12 (K-12) award. Dino Miele is the Chief Information Officer at the District School Board of Niagara (DSBN) in St. Catharines. Dino has led the charge on some key innovative projects to modernize digital infrastructure in the Niagara region. Firstly, he led the creation of a new state-of-the-art data centre at DSBN houses a central networking site connected with the Niagara Regional Broadband Network and makes shared services available to the Niagara community. Secondly, Dino established the Niagara Region CIO Consortium between the region’s health, education and government entities, which helps promote a healthy social, economic and environmental ecosystem. Finally, Dino devised the iHUB, the first educational technology incubator in North America to be located inside a converted K–12 school. Designed for Niagara youth to explore innovative start-up ideas, the iHUB operates in partnership with the DSBN, Brock University and Niagara College, providing a physical and virtual space for the collaboration of educators, students, researchers, entrepreneurs, and educational technology companies to support the development of innovative educational approaches, tools and resources. Dino’s passion and leadership has stimulated an innovative environment that effectively utilizes technology as a tool for stimulating, steering and sustaining innovation in Niagara. Bill Summers presents Alan Darnell the Higher Education award, accepted by Amaz Taufique. Alan Darnell is the director of Scholars Portal, a shared service of the Ontario Council of University Libraries (OCUL) that is truly collaborative. Founded in 2002, Scholars Portal provides a shared technology infrastructure across 21 university libraries in Ontario, enabling data management and resource sharing that can further the work conducted by Ontario universities via Scholars Portal online services and the online inter-library loan platform. Alan and his team help save time and resources as they facilitate the digitization of massive amounts of library data. In addition, projects such as the Accessible Content E-Portal (ACE), enable users with print disabilities to obtain resources in accessible formats. A project like Scholars Portal requires coordinated action at a provincial level. Alan, along with his team, has worked tirelessly since 2003 to provide content aggregation and preservation services for 21 university libraries. This shared technology has tremendous impact on digitizing and archiving libraries and in facilitating collaboration between the users. Under Alan’s leadership, this ground-breaking shared service demonstrates how higher education institutions can go beyond data management to enhanced knowledge circulation, using state-of-the-art resources in Ontario.